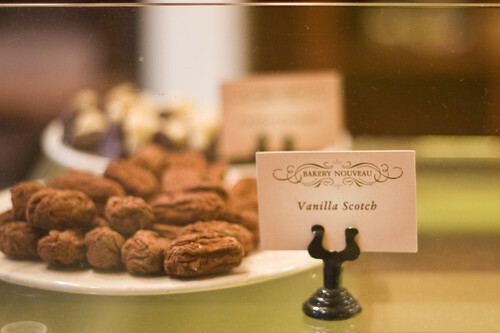 Some friends had been begging me to go to Bakery Nouveau in West Seattle for about year now. I just hadn’t seemed to be able to get over there for one reason or another. Last week I was in the area for dinner and, although not the most opportune time, I thought I’d swing by with my dinner companions and pick up a thing or two for breakfast the next morning. Now, I had sampled the food before because MG and DW, in their efforts to get me over there, had provided me with all kinds of tasty treats. But I was anxious to see the source and the full range of offerings. Or at least whatever would still be available at that time of the evening – we arrived shortly after 6:00 pm and they close at 7:00 pm so I wasn’t expecting an abundance of choices. We walked in to a slow but steady stream of customers. A few people were sitting at tables, a couple people were ordering when we arrived and while we were making our selections and placing our orders a couple more people showed up. With the cases being clear of customers I took the opportunity to take a few photos, as did one of my friends. Then I placed my order for several items – I wanted to test a bit of it all! 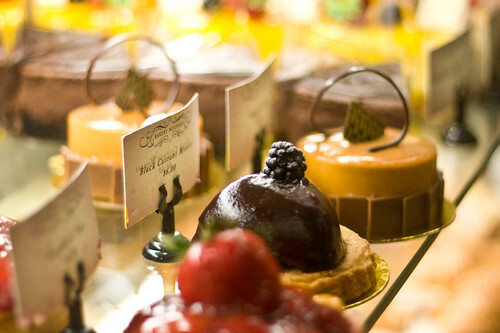 – paid, and as I was waiting for another friend to place her order a new tray of beautiful, freshly sliced chocolate cake or torte wedges was brought out from the back. As I leaned over to snap one last shot, I heard someone say, "Do not take photos." I looked up, a bit in surprise, as the other folks behind the counter had not said anything. I guess I took too long to reply as the man repeated himself, a little more strongly this time. I said "sure" and put my camera away. I was disappointed but I know that some places do not like photos taken (although the only other place I have been asked not to take photos was a place in New York – in the Paris bakeries they even turn the pastries so you can get the best angle!). But I was a little surprised that his manner was a bit aggressive, I guess. Still I probably wouldn’t have thought much of it except for what happened next. As the man (the manager I assume, it was not the owner) walked by the register where another employee was ringing up a purchase, the man said something to the effect that "everyone’s a food blogger", in a condescending manner. Right for me, wrong for my other friend taking photos. And then continuing in his condescending manner went on to say, "but we must all have our "art"". I did not hear him, but it turned out it was my other friend who was being helped at the register and she, of course, did. To make the statement in the first place was rude. To make it in front of other customers is too rude to be ignored. The next morning I tried to put it behind me to just enjoy the items I’d purchased but it just made me so sad. First, bakeries should stress customer service and if they don’t want photos, fine, but be civil with the request. Second, a place that makes its living creating things that they hope appeal to customers should be happy when someone appreciates them enough to want to photograph them. And let me just say that I took a total of six photos that night – there would have been seven – I did not use flash, I did not interfere with customers in anyway. Only when the cases were free and while I was making my own selections did I shoot anything. One of the photos was actually taken outside. So, while I do think the pastries are very nice, I’ll probably never go back. I don’t mind people asking me not to take photos. I do mind not being treated with respect. Yikes…it makes me feel so awkward when these "photo issues" come up….I\’ve had my menu taken away before becuase they thought I was stealing their idea. (See mt review for Sushi Sky)…my friend just brought me some pastries back from here though and they were AMAZING. I guess the experience really ruined it huh? That can happen. Hi Mijune!It wasn\’t so much that they didn\’t want photos. I would have totally understood if someone had just come up to us and asked us not to take photos or explain that their policy was not to allow them. I\’ve had that happen before and I get it. It was the way they handled it, the rudeness and disrespect that bothered me. I know they make wonderful pastries and many of my friends still go there and that doesn\’t bother me at all. But there was actually a bit more to it than I reported here and I can\’t see myself patronizing this place again.